Paris [France], Dec 7 (ANI): Ahead of the planned demonstrations on Saturday, French authorities have begun tightening security in different parts of the country, including capital Paris, amid fears of further violence after agitators clashed with police last week as part of the "yellow vest" protests. The renowned Eiffel Tower and some museums in Paris would remain out of bound for visitors and tourists. A planned football match between two of France's biggest teams St Etienne and Olympique Lyonnais has also been called off in view of the weekend demonstrations, euronews reported. Violent protests, which have been held across France for three weeks, have resulted in the death of four people and presented a great challenge to Macron's plans to raise taxes. 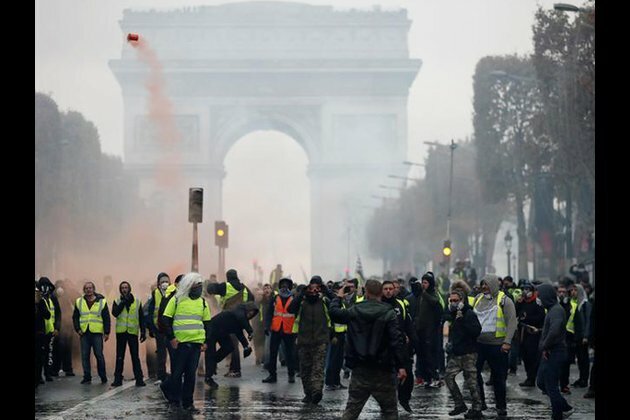 The demonstrations, which began on November 17, went on to become one of France's worst rioting in decades as protesters clashed with the police, looted shops and set fire to vehicles around Paris' Champs Elysees avenue last weekend.